Every end of year we try to allot a few days to do tech work at the studio. This includes basic cleaning but also wiring changes, gear upgrades, and basic maintenance on gear that gets used all year long. This year there was only one piece of gear that needed immediate attention. It was a pair of Pultec equalizers made by Amtec. Pultec is a shortened version of Pulse Techniques, the company that made all those classy old eq's with the big bakelite knobs. More than that though, Pultec came to represent a style of equalizer design that is classic and still in demand today. The basic idea is that each channel of eq would have a few basic filters placed at musical points in the audio spectrum. 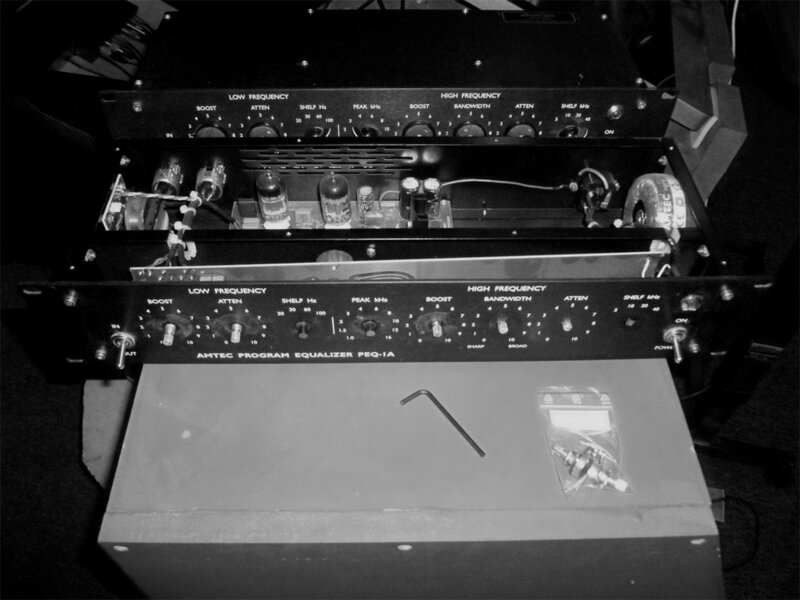 For instance the pair we use has a low shelf that can be set at 100, 60, 30, 20hz coupled with a high pass filter, a mid frequency bell that has a range of frequencies between 1000 and 20000hz, and a low pass filter with settings at 5, 10, 20, and 40khz. This allows us to add thickness to a mix or instrument focussed around the bass guitar, kick drum, or even lower while adding a focussed point or wide push in the mids or highs while potentially mellowing the super high frequencies. In the gallery you can see the old schematic for a Pultec style eq. 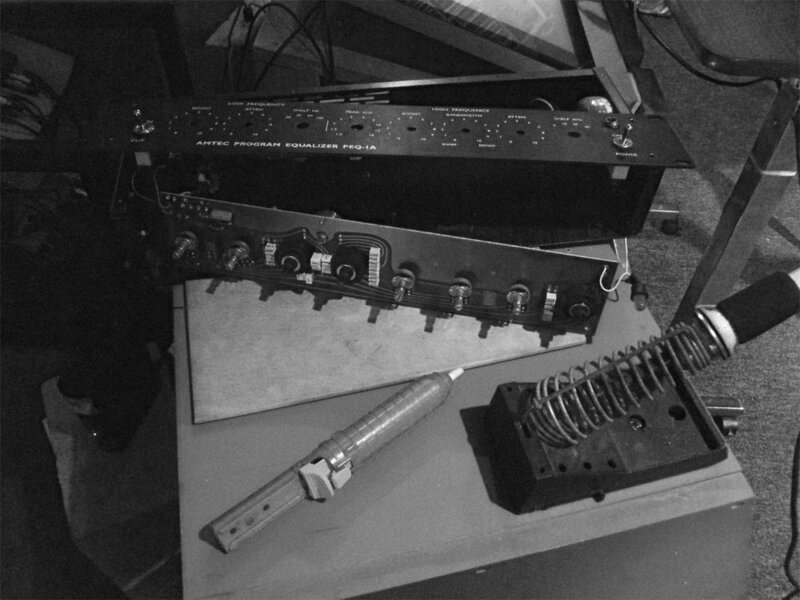 Clearly noted in the upper left is the passive equalizer section. This is shown as a block because at the time they were using proprietary designs so they 'potted' them. This means that they seal an important part of a circuit in a casing so no one can see what is inside. Below the eq section on the left is the power supply. 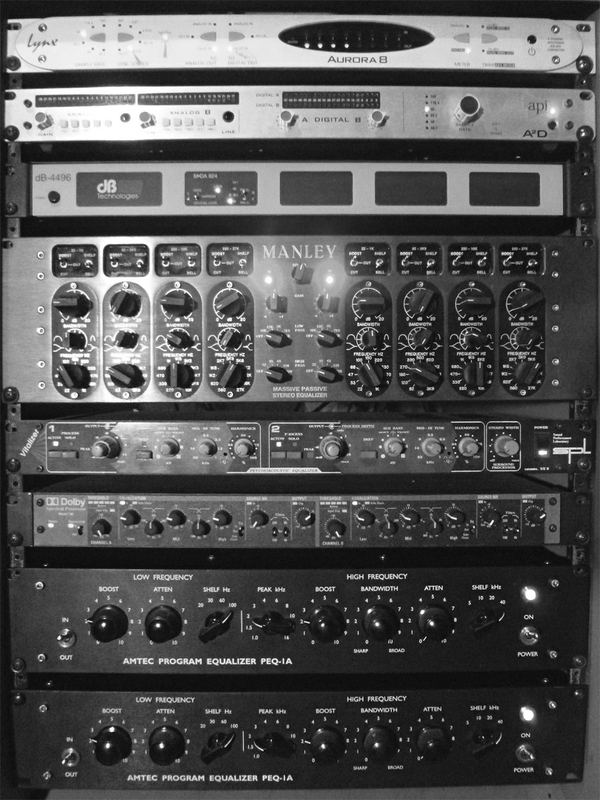 This is to power the make up gain section of the eq that is on the upper right with the tube amplifiers. Lastly there is an output transformer ( also see one at the input ). Part of the great sound of these boxes is the sheer amount of iron used in each channel, that in combination with the passive eq design and simple tube amplifier add up to a big deep sound that is full of life. On to the work, I noticed the mid frequency bell bandwidth potentiometer on one of our Amtec's was crunchy feeling. The knobs are big but the pots are somewhat delicate. Luckily the company is very nice and sent me a new matched pair of these at no charge!